The world’s most expensive smartphone has finally arrived in the market. Those users eager to get one of their units and can take your ticket and travel to Singapore, the land where this event taking place these days, and carry a suitcase full of banknotes to boast of this device. What do we mean? Del Vertu Ti, a phone that, in terms of technical specifications, would have sounded fairly well early last year 2012, but that jumps to the present day as one piece only ostensible. While it is believed that for its arrival in the West, the device in question would have a label base of 10,000 DOLLAR s, its formalization in the Asian market shows a little more expensive, with a price of 75,000 Yuan, the change is little more than 12,000 USD or 9,000 Euros. In the technical, as we pointed out a few weeks ago, it boasts a display of 3.7 inches, 480 x 800 pixels, 1.7 GHz dual core processor, 1GB of RAM, 64GB of storage, WiFi and Bluetooth connectivity, eight cameras and 1.3 MP and the presence of Android 4.0 Ice Cream Sandwich. 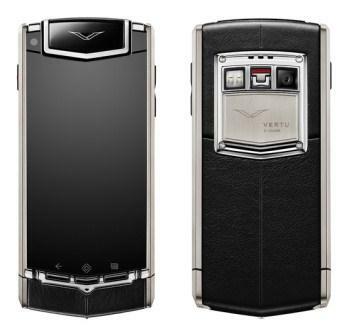 Significantly, it is the first Android handset from Vertu. Its astronomical price, perhaps this is because manufactured by hand, with a titanium chassis, sapphire crystal display and some leather.